There is a renewed interest in Cyprus’ copper deposits due to record high copper prices, and an improvement in mining technology. 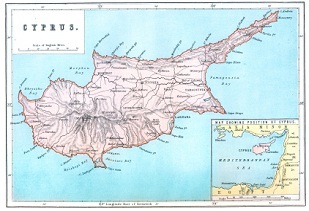 The island of Cyprus is so closely associated with copper, that the name “copper” is actually derived from the Greek name for the island, Kupros. Cypriots first used copper to make tools around the 4th millennium BC. At that time copper was not “mined”, rather, pure copper could be found right on the island’s surface. Later, rich copper-bearing ores were discovered on the north slope of the Troodos Mountains which lead to the mining of copper resources in the Bronze Age. Through the Roman Era Cyprus was the main supplier of copper to the world. After the fall of the Roman Empire, there was a hiatus in the nation’s copper mining activity until the 19th century, when pyrite and chalcopyrite were mined, mainly for sulfur production, but also for copper. Copper was produced by several companies from a number of mines until 1974 when armed confrontation between Greek and Turkish Cypriot military forces suspended mining operations. Cyprus Mines, which was the major copper miner, terminated operations when its mines were divided by the cease-fire demarcation line between Greek and Turkish forces. Other companies continued copper production through the political dispute, however, all operations were halted in 1979, when low copper prices rendered Cyprus’ low grade deposits uneconomical. Recently, there is a renewed interest in the country’s copper deposits due to record high copper prices, and an improvement in mining technology. So far, over 30 copper deposits, ranging in size from 50,000 to over 20,000,000 tonnes, with grades from 0.3 to 4.5 percent copper have been discovered in Cyprus. There are five copper mining districts in Cyprus: the Skouriotissa area, the Tamassos area, the Kambia area, the Kalavassos area, and the Limni area. Most of the mining activity has been centered on these districts, however, a few isolated deposits have been found through the country, including the Troulli Mine (Larnaca), Mangaleni (Limassol), Peravasa (Limassol) and Vretchia (Paphos). Despite a lengthy mining history, it was not until the late 1970s that the ore genesis model behind Cyprus’ copper deposits was fully understood. The discovery of massive sulfides in association with the high-temperature black smokers at the crest of the East Pacific Rise confirmed that the island’s copper deposits were created by the discharge of hydrothermal fluids from the black smoker chimneys. As the hydrothermal fluids were discharged, sulfides precipitated on the ocean floor, in some cases forming volcanogenic massive sulfide deposits. The Skouriotissa is the world’s longest producing copper mine. The Cyprus Mines Corporation began exploring the Skouriotissa in 1914 and worked the mine until 1974, when it was taken over by Hellenic Copper Mines Ltd. As mentioned earlier, improved economics are encouraging the reevaluation of Cyprus’ copper deposits, and in 2010, around US$13.1 million worth of copper was exported from the mine. The majority of the copper produced in 2010 came from the processing of waste material from previous mining operations. In the past, only the richest copper deposits were exploited, now, given the new technology and economics behind the copper market, there is a point in revisiting some of the material left behind. In addition to reprocessing previous waste material, Hellenic copper is looking into reopening some of the mine’s ancient pits. Mining in Cyprus country was stifled in the 1970s due to two main factors: the invasion and subsequent occupation of mining areas by Turkish forces, and the collapse in metals prices. Skouriotissa is the only currently operating mine. However, according to The Mines Service of the Republic of Cyprus, there is renewed interest in the country’s mineral reserves from the international community. The Mines Service, who is responsible for the management of the country’s mining industry, including the granting of permits, claims that at the present time there are about 30 prospectors with permits searching for copper and gold in the country, and there are also many applications under examination. While The Mines Service of Cyprus has indicated that there are quite a few prospectors in the region, the number of publicly traded juniors operating in Cyprus is, at this time, limited, and includes Northern Lion Gold Corp. (TSXV:NL), and EMED Mining (LON:EMED). Northern Lion is a Canadian-based mineral exploration company with a variety of European projects. The company has initiated an exploration presence in Cyprus and plans to actively pursue copper-gold opportunities on the island. Northern Lion is interested in Cyprus because they believe that the region is underexplored. EMED is an exploration and development company with mineral interests in “particular” mineral belts in Europe, the Middle East, and Central Asia. In Cyprus, their area of interest is on the Troodos ophiolite complex. The amount of prospecting licenses currently being awarded means that this list of publicly traded miners at work on Cyprus is bound to grow in the coming years.